The 24/7....365 Professional 5lb. 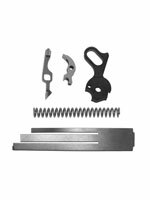 Trigger Pull Set is the most rugged, reliable, fire control set that has ever been designed for the 1911. The 24/7....365 will drop in your 1911 and give you that 5 lb. trigger pull demanded by those who?s lives depend on flawless, reliable preformance from their 1911 tactical pistols. The sear spring will need to be properly tensioned to give you the 5 lb. trigger pull in your pistol. Suitable for use in any 1911 pistol.